Congratulating AIDMK for their victory and hoping changes in VNR. 2011 Virudhunagar Municipal election has been won by AIDMK (11,921), Nagar Nalla Amaipu ended up second (7,019) followed by DMK(6,868), Congress(5,300) and DMDk(5,100). Atleast are runners up. Thanks to all who voted for Nagar Nalla Amaipu. It will continue its work for the welfare of our town. It does not regret about losing. People talk about candidate selection! Fine! but only people who come forward can decide and debate. 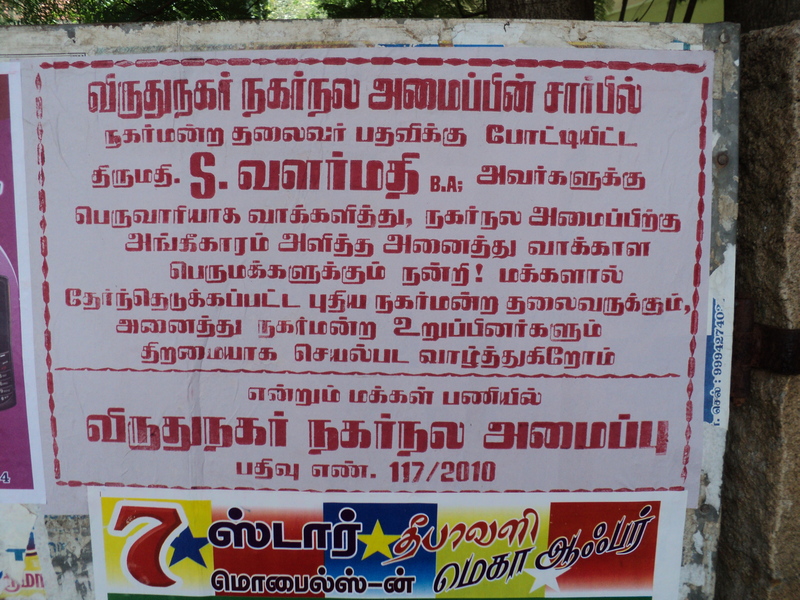 If Virudhunagar can vote to defeat the great KAMARAJ and praise him after his demise. There is no surprise that even after the pathetic state in virudhunagar, 17 councilors been re-elected and congress having a reasonable share of 5000 votes. This shows “Personal gains -bribed water pipelines, tampered house/business tax, loans subsides and land allotment” has a big roll in vote bank. Nagar Nalla Amaipu will continue its work for public cause and try educating voters to look beyond selfishness. Looking for a better show if possible in the next round. I would like to call me a “Social Activist”. This entry was posted on November 5, 2011 at 9:03 am and is filed under FOR, Virudhunagar, VNA. You can follow any responses to this entry through the RSS 2.0 feed. You can leave a response, or trackback from your own site.